Dedicated to the FUJIFILM X70 digital camera, the silver WCL-X70 Wide Conversion Lens broadens the original lens' field of view by approximately 0.8x to offer a wider 21mm equivalent focal length. 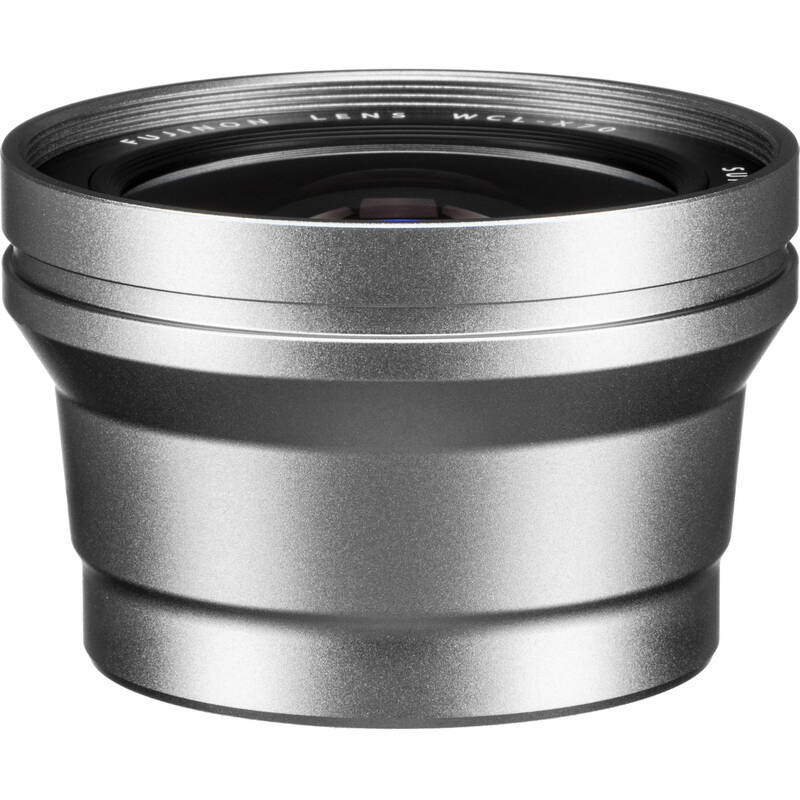 This add-on lens is designed to maintain the performance of the original lens, including notable image quality and fast focusing capabilities. Box Dimensions (LxWxH) 5.5 x 5.2 x 4.4"
WCL-X70 Wide Conversion Lens for X70 Digital Camera (Silver) is rated 4.3 out of 5 by 3. Rated 4 out of 5 by Brian from Nice addition to X70 WCL-X70 gives a nice wide 21mm equivalent field of view. Made of high quality materials and has a nice, solid weight. I don't notice any degradation of photo quality using this adapter. The rubber lens hood is a little difficult to work with and I wish it was made out of plastic. The only negative thing to mention is that when you attach the adapter to X70, you have to go to the camera menu and change the setting of the camera to accept the lens and get the proper field of view, and then re-set the menu when the adapter is taken off the camera (I wish the camera would be able to recognize the adapter automatically). Rated 4 out of 5 by Doug B. from Fun and flexible addition to the X70 Very well built (surprisingly heavy) and mounts solidly onto the X70. As you would expect from an auxiliary lens, optical performance is down a bit. The center is very sharp at all apertures, the corners need stopping down to 5.6-8.0 to maximize performance. It's very nice to have the 21 mm equivalent view. For $200 you can't go wrong! Rated 5 out of 5 by Lynn from Great lens Excellent way to get a 21mm lens on the X70. Is it possible to use filters on it? Yes, it is threaded for 62mm filters. I've used several filters on mine. See this Fujifilm spec sheet on their website. I'm a JPEG shooter -- Does the camera auto correct for distortion (particularly in people shots) or does this have to be done in post? JPEG or RAW doesn't matter, you will need to update the camera's firmware to eliminate the distortion. Go to the Fujifilm website, Support, Downloads &amp; Firmware. Make your way to the X70 page and you will see instructions to check your current firmware version. If your camera has ver. 1.00, which mine did, the WIDE CONVERSION LENS on tab 3 of your camera menu will be ghosted and unusable. Once you update your firmware to ver. 1.10, that camera menu option will be selectable. You must select this option in your menu when using the lens, and it will remove the distortion. Just be sure to follow the firmware update instructions to the letter, and you should have no problems. Worked perfectly the first time for me.